Hundreds of people descended on Victoria Square and took to Ste. 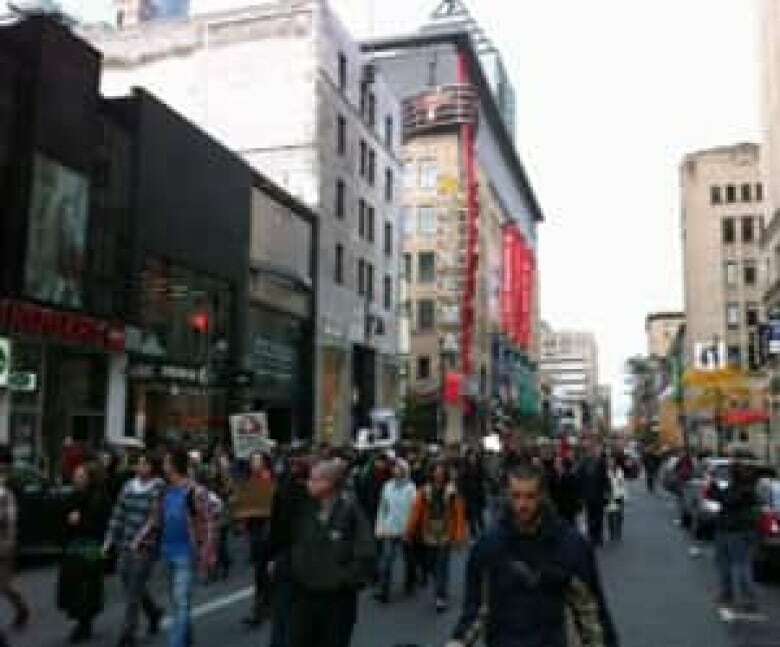 Catherine Street Saturday as the global Occupy movement officially reached Montreal. Hundreds of people — some bearing signs, others carrying noisemakers and a few armed with camping gear — descended on Victoria Square Saturday as the global Occupy movement officially reached Montreal. The event started in the morning with a few people gathering at the square. But by late afternoon it had transformed into a march by more than 1,000 people down Ste.Catherine Street. 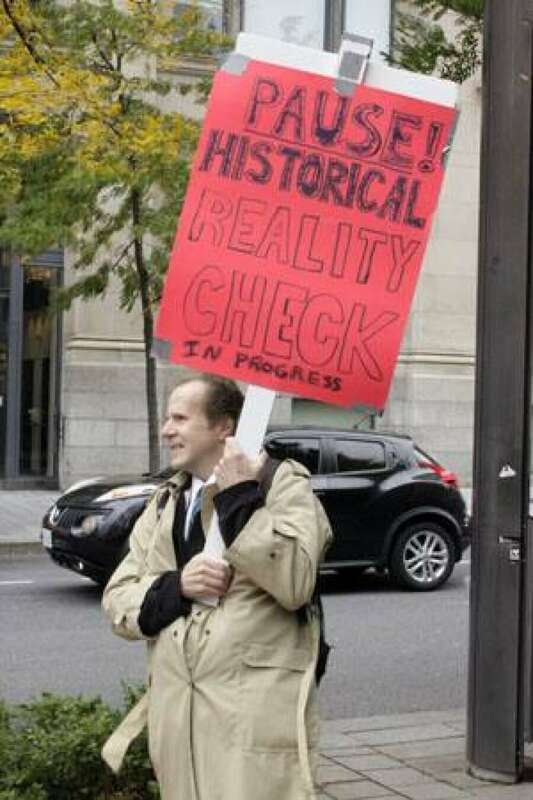 Occupy Montreal, an offshoot of the movement's occupation of Wall Street in New York City, is one of several such events taking place across Canada and around the world this weekend. 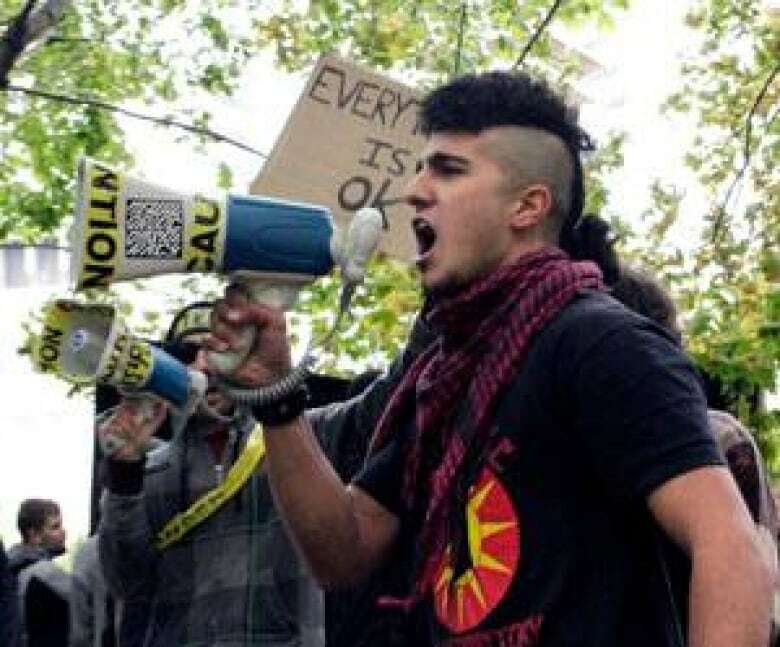 The movement takes square aim at problems in the current political and economic system, and at the growing disparity between the masses and elites. The stationary demonstration at Victoria Square transformed into a march on Ste. Catherine Street Saturday afternoon. ((Alison Northcott/CBC)) However, people gathering in Montreal came with a collection of causes they felt needed a voice: poverty, anti-corruption, workers rights and democratic action. Eric Bouthillette of the Love Police, one of the groups that contributed to the local event, said the idea was not to come ready with a lists of demands, but to collaborate with a diverse range of people. "Every [person] comes from a different part of society," he said. "That is who we are. That is what we're trying to do –unite every side of Quebec as once voice. One voice, many people that's stronger than the government itself." If you'll be at the protests, send us your photos and videos. The idea was to allow the day to develop organically, Bouthillette said. Organizers convened what they called a "general assembly" at 3 p.m. to discuss ideas, but that was one of the few organized events of the day. At that meeting, participants voted to take the movement to the streets and set off in the hundreds west down Ste. Catherine. The morning started slowly, with more reporters than demonstrators filling the square. By 11 a.m., the area was packed with people dancing, setting up tents, debating in small groups and unfurling banners. Logan Pelletier,16, dragged two friends out of bed to make sure they would be among the first to arrive at Occupy Montreal Saturday. "It's nice to see something like this just happening in a city like this in a capitalist society and it excites me," he said. One of the hundreds of demonstrators at Square Victoria Saturday morning. ((Melinda Dalton/CBC)) "I hope that this will be further developed," Pelletier said. "Who knows where this could go." Police on foot, in cars, on bikes and on horses maintained a visual presence along the square's perimeter, but didn't interfere with the demonstration as more and more people filled into the square. 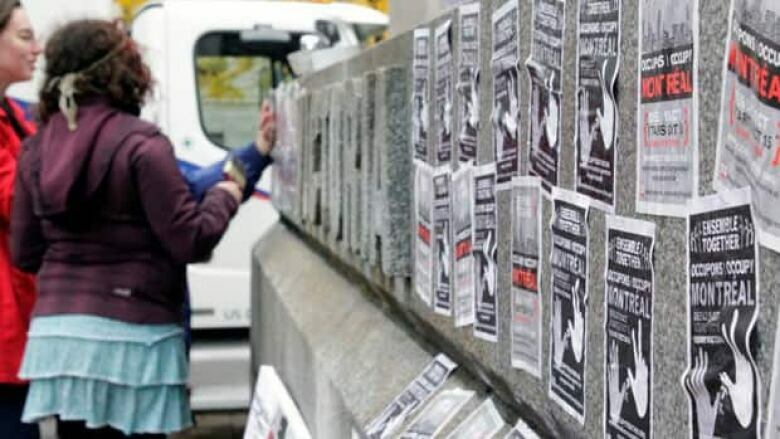 Montreal Police spokesperson, Olivier Lapointe, said they didn't intervene when a group started pasting handbills on the statue of Queen Victoria because it's not considered permanent damage. He did they would get involved if they spotted anyone spray painting or causing other damage to property. "For now, we can say that it's peaceful and demonstrators are behaving in a way that we like to see," he said. By mid-day, the square looked more like a music festival than a protest. Tents occupied a significant portion of the green space and impromptu jam sessions and debates sprang up in small groups throughout the square. Demonstrators with megaphones led the group in chants Saturday morning at Victoria Square. ((Melinda Dalton/CBC)) Children danced and coloured on cardboard in an area set aside for families. For some people passing by, the diversity of the messages on signs, banners and blaring from megaphones made it seem like there were too many voices saying too many things for anyone to be heard. Sang Nguyen, an Australian in Montreal for a conference, said he considers himself left-leaning, but he didn't understand the objective of event. "I just can't tell what this is," he said with a shrug. Bouthillette said the plan was to continue occupying the square until at least Monday and possibly interrupt or prevent the opening of the Montreal World Trade Centre and stock exchange tower. Montreal has a bylaw that prohibits sleeping in parks past 11 p.m., but Lapointe said the area is public square, not a park, so that bylaw doesn't apply. He said he couldn't comment on what action police will take in the coming days if they have to remove people from the square, but said officers will be on hand to enforce the law.